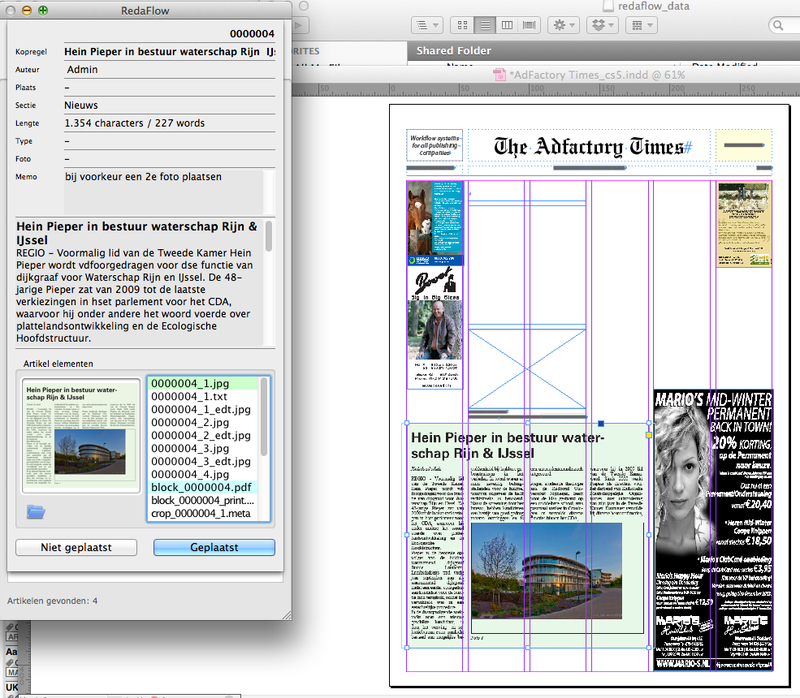 RedaFlow is the application with which the articles can be placed on the InDesign pages. It connects to the RedaFact database and the fileserver, to show a list of articles, that can be filtered on title, date, author, page, section etc. In this way only those articles that need to be placed on the desired page or section are visible. Pictures are linked to the articles, so no need for searching where's the photo belonging to this text... As a result articles and pictures can easily be draged and dropped on the pages in InDesign (or Quark). Since the text is pre-formatted by the authors, paragraph styles are set automatically. In addition it is possible to import ads for the editorial pages from the AdFactory system into RedaFact, so that really all material for the editorial pages is available in one and the same list.